This is the perfect place for Basket Express to present blog posts and for you to join in the fun, too! 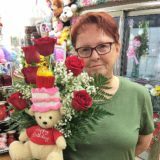 Here we will discuss holidays, occasions, reasons to send gift baskets and flowers, exciting events occurring at Roadrunner Florist & Basket Express. 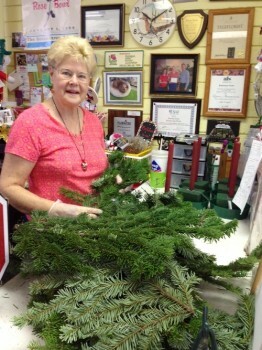 Click here to read about Pamela of Roadrunner Florist and Tina of Basket Express. 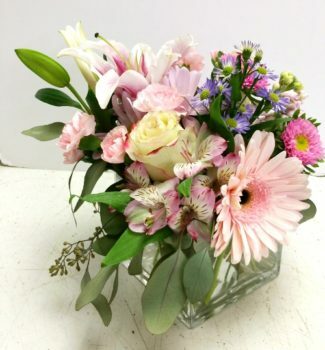 We are REAL PEOPLE designing Floral Arrangements and Gift Baskets for REAL PEOPLE (like you!)! 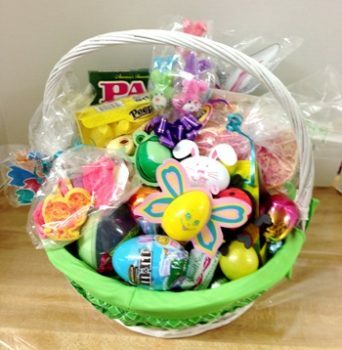 What’s Hoppin’ at Basket Express and Roadrunner Florist is the Easter Bunny! I sent a text to a customer in Washington, DC this morning reminding him that I’m playing Easter Bunny for his 3 children and I needed more information about what his 11 year old son might like! That’s CUSTOMIZATION at it’s best! The answers didn’t surprise me! Sports (Washington Nationals or Washington Wizards) or Sports! So I’m going to include basketball goodies and chocolates and bunnies! Designing Easter baskets is fun. It’s a great time to celebrate spring, and there are lots of things to do outside. 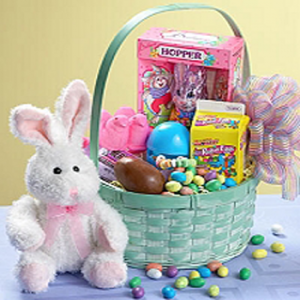 Of course there’s the Cadbury Bunny and all of the “imitators”, the fun of coloring eggs, and the gathering of family and friends for great food and spirit. If you’re thinking about a custom designed Easter Basket this year, then you’d better get a’hoppin’ because this bunny is getting pretty busy! 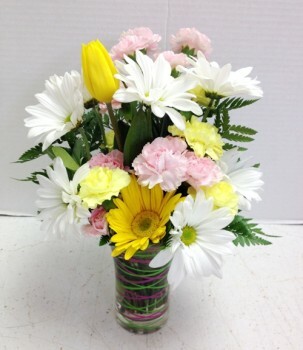 Here are a few choices that might bring a smile to your spring celebration! And then there are flowers! Beautiful Spring Flowers! Perfect for Passover, Easter and Spring! 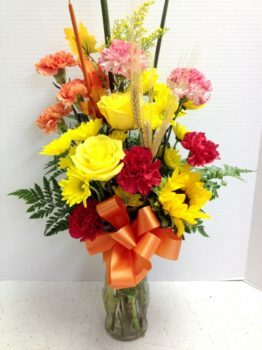 Here are a few examples of Signature Designs from Roadrunner Florist! 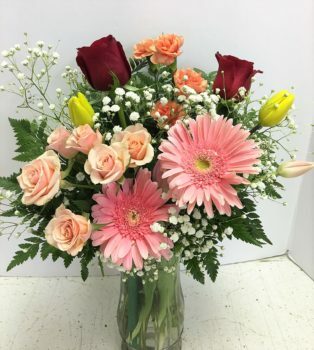 Whatever you choose, however you celebrate, wherever you are, remember Basket Express and Roadrunner Florist for your Easter, Passover and Spring gift baskets and flowers! Happy Spring, one and all! 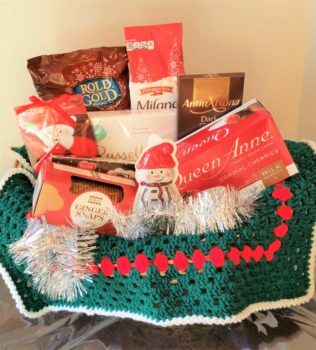 or our Christmas Fancy Gourmet Basket for a group of people in your life! We are busy being Santa Claus! 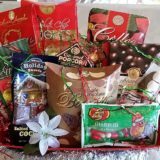 Order your Happy Gift Baskets from Basket Express! We’re anxious to work our magic so you look good! We look forward to making you happy, too! Thought you might think there aren’t many flowers left to represent December, you would be surprised to see that these are as beautiful as those of us who are December babies (haha!). 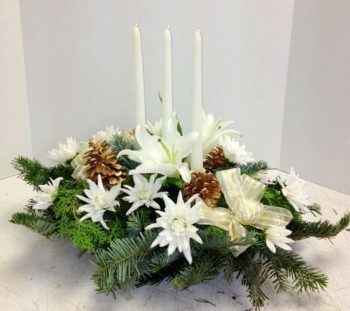 The birth flowers for the last month of the year are the holly and the narcissus. 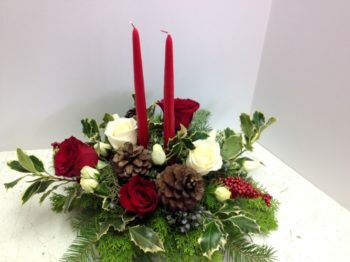 The holly is a symbol of good wishes for domestic happiness. Even though some birds and animals love eating the berries, remember that they are semi-toxic for people. Meanwhile, the paperwhite narcissus sends a message that you want the person to whom you give the flower to remain the same as they are. 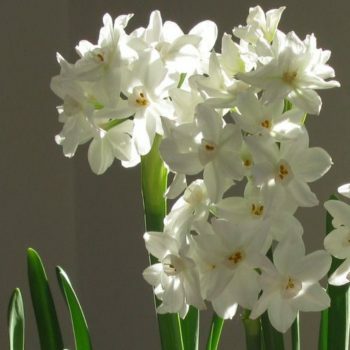 Keep in mind that even though there are lots of types of narcissus, the paperwhite one is the birth month flower for the month of December. There are some people who believe that the flower of the month for December is the poinsettia. 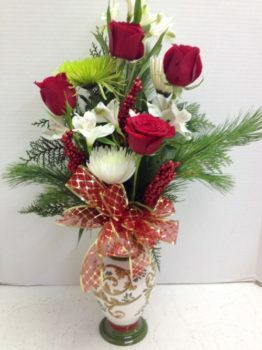 They are indeed associated with Christmas, but not everybody considers them the “flower of the month”. The ancient Aztecs considered them as being symbols of purity, but now they stand for success and good cheer! 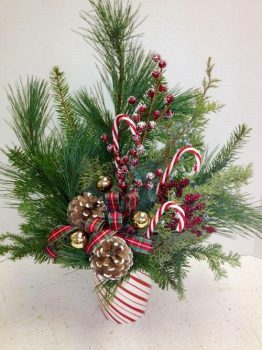 What fun it is to design and deliver beautiful Christmas arrangements with holly! 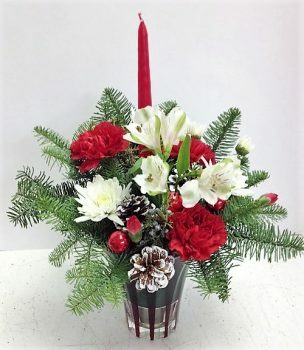 We know you’ll be sending floral arrangements and gift baskets for Christmas this year. We look forward to hearing from you! It’s Christmas Time and our little elves are working hard to make you look good! 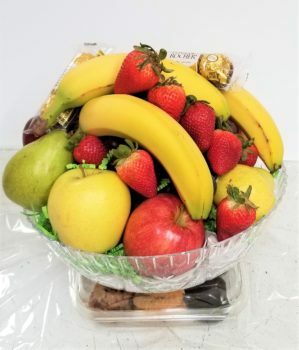 From chocolates to fresh fruit, cocoa, muffins, cheese, candies, crackers to sausages, from cookies to nuts and everything in between, It’s Christmas Time at Basket Express and Roadrunner Florist! 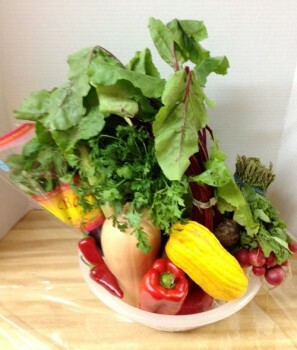 Our lottery basket can be decorated with the fancy Christmas colors and fresh greens! It’s a WOW! This is another great option for you. 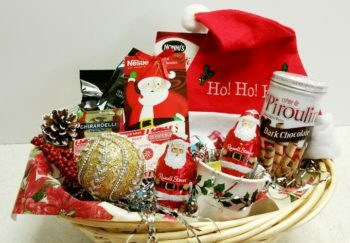 It’s a terrific gift basket including coffee and a great Christmas mug! 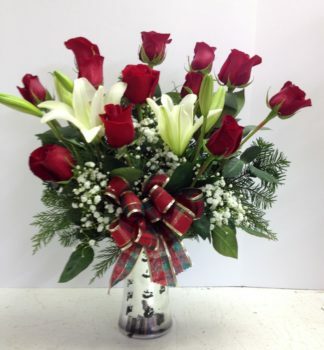 Don’t forget the fresh fragrant flowers that brighten and cheer your family and friends! So many to choose from, so many people to make happy,… let us help you today! 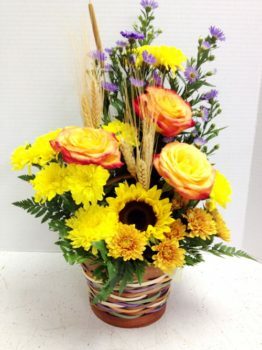 Arrangements, centerpieces and yes, gift baskets on the website of Roadrunner Florist! I love centerpieces for Christmas. They’re festive, beautiful and they complete the table and they smell terrific! because it’s all white flowers and the fragrant Christmas greens. I can smell it from here, can you? 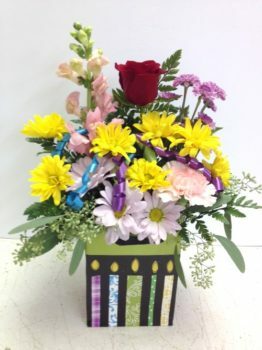 No matter which one you choose, now is the time to order your flowers and gift baskets from Basket Express and Roadrunner Florist! 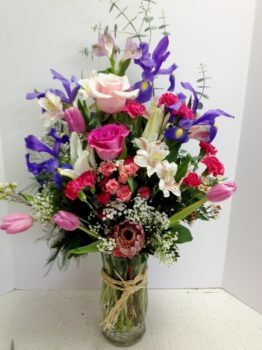 Let us design and deliver a unique gift from you! You’ll be glad you did! Check out our reviews on Yelp! We look forward to hearing from you! 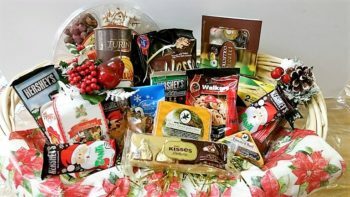 Is there such a thing as Healthier Gift Baskets? If there is, then Basket Express is the place to find them! 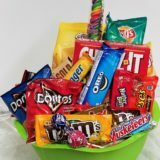 Do we really design gift baskets with foods that are healthier than ice cream? Well, SURE! 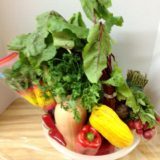 We can certainly design a gift basket with 9 Mood-blasting Foods that are healthier than your go-to pint of ice cream! Can you guess which one is the 10th one? Experts like YourTango health expert Lisa Petsinis tell us ice cream may sound like a good choice when you’re feeling down or stressed, the truth is: If you really want a mood-boost from food, there are smarter ways to get it. By eating “happy foods” that involve the right nutrients and neurotransmitters — such as serotonin, dopamine, and norepinephrine — you actually can eat your way to happiness. Nuts are nutrient-dense, often containing high amounts of magnesium, selenium, and folate. Some nuts contain the amino acid tyrosine, which contributes to the creation of the neurotransmitter dopamine that activates your pleasure system. Bring on life’s challenges! Eat just a few brazil nuts a day, and you’ll meet your requirements. Alternatively, make up a bag of trail mix of nuts, cherries and dark chocolate with even more good stuff and nibble your way to glee. 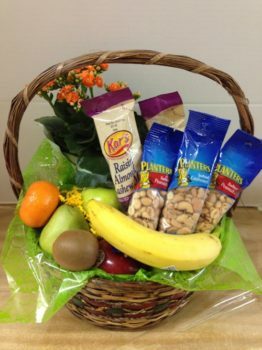 Yes, Basket Express can design a gift baskets full of healthy nuts! 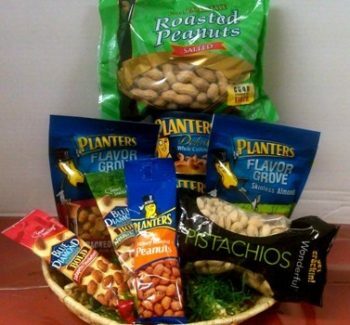 and this is our Nut Man Basket! Both are great choices for Nuts! Bananas are full of tryptophan, too. If you’re having trouble sleeping, try making banana tea and ease your way into a slumber. They are a staple in my life, and should be a staple for you, too! 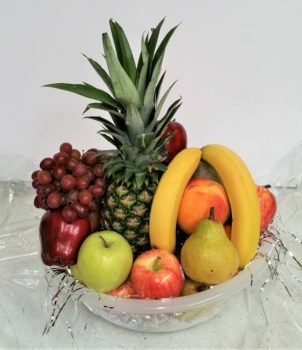 This is our Fresh Season Fruit plus Nuts Basket. 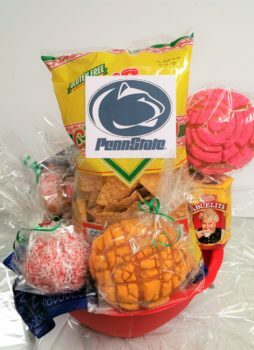 Talk about putting great things together in one gift basket! To start your day off right, trying to have a bowl topped with banana slices and nuts for added benefit. This meal will stabilize your sugar levels and raise dopamine. You’ll be full longer, and your mood will be on an even keel. Oatmeal is especially helpful if you’re prone to mood swings (hint: eat some after you’ve indulged in a pint of ice cream to recover). 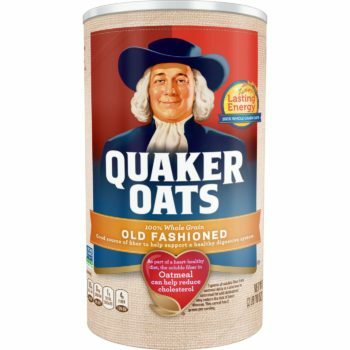 I LOVE Oatmeal!! You can tell it’s winter (well cooler!) when I start eating Oatmeal for breakfast every day! I even like the Steel Oats (when I get it at a restaurant ’cause I haven’t figured out a way to make it at home … hint hint!). from Basket Express, just let us know! 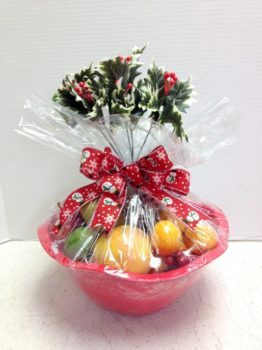 We are happy to add Salmon to any gift basket! Our preference is this the World Market® Classic Smoked Alaskan Salmon which is prepared with precision to bring out a medley of irresistible flavors. Caught wild in the icy, pristine waters of Alaska, each fillet is selected with care and slowly cured in savory brine before being lightly smoked over native Alaskan Alder wood. The result? A truly remarkable taste experience. And because it can be stored at room temperature or below, it can be enjoyed any time, anywhere! 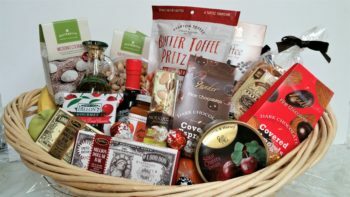 Here’s our Send ’em Gourmet and More gift Basket. It’s loaded with everything you can think of, including crackers, cheese and salmon! While the sound of a juicy steak might make your mouth water, you’ll get even more of a mood lift from a leg of lamb. The source of iron is ideal, more easily absorbed by the body than other red meat. Grass-fed lamb is super rich in zinc, B6, B12, and magnesium, too. It also contains conjugated linoleic acid (CLA), which counteracts the effects of the stress hormone cortisol. If you want lamb, I suggest you find it at the grocery store! Mimic the taste and sensation of eating ice cream by enjoying a cup of Greek yogurt. Available in many flavors, this wonder food contains calcium, protein, CLA, and of course, the star, probiotics. Make it a daily treat, and you’ll notice a difference in your gut and your mood. Seems to me, if you’re going to add Yogurt to a gift basket, then you want to add cheese and crackers! Maybe some nuts, fresh fruit and other healthy goodies! How about some veggies! 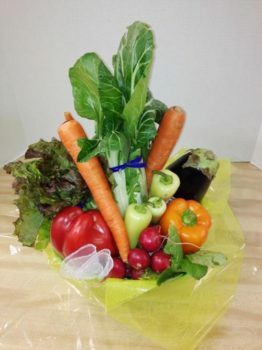 Here is our Top of the Line Veggie Basket! We could add Greek Yogurt to these for you! I see Spinach in our Veggie Baskets! 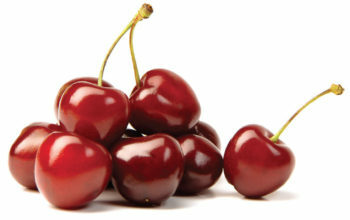 Red tart cherries are well known for their melatonin content. Have a few or sip some pure juice an hour before bed and you’ll be whisked off to dreamland. That is one definite way to wake up happy. gift baskets. They’re a very special treat! If your head is spinning over whether coffee is good for you, you’re not alone. Anything in excess is probably bad for you. That said, an occasional or even daily dose of espresso might just do the trick. If you’re new to espresso (and I don’t mean the Starbucks variety), learn how to drink espresso like a true Italian. Imagine yourself in a bar in Venice, drink it back, and you’ll be sure to smile. Each of our healthy gift baskets can include espresso. We can substitute Coffee with espresso! That’s why we’re unique and your gift baskets are, too! 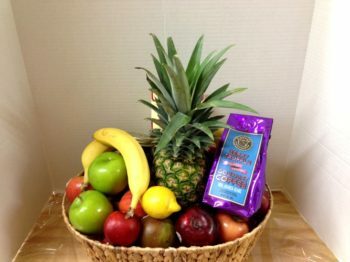 Here is our Fresh Fruit Coffee Gift Basket! 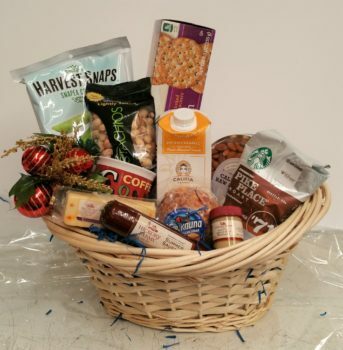 here is our Coffee and Nuts gift basket. Be prepared: always keep a dark chocolate bar on hand. Though you might want to indulge in the entire bar, only one or two squares will do. Eat the square mindfully, savoring each bite. It will taste so fantastic that you won’t even realize what you’re eating contains antioxidants, fiber, magnesium, copper, iron, selenium, and zinc. While a pint of cookie dough ice cream may be very tempting when you’re down in the dumps, trying these mood-enhancing foods will be better for you in the long run. Lift your spirits and build healthy habits at the same time. I have a great story to share with you. My mother, my sister-in-law and I were walking in a mall in Denver a few years ago. One of the chocolate stores had samples (how wonderful!) on their counter, and we each took a piece.Lucy took milk chocolate and my mother and I took DARK chocolate. We didn’t even notice that our favorite was dark until Lucy called it to our attention! I don’t think it was the healthy alternative for us, but I do think it was the tasty alternative for us! It’s a Chocolate Christmas can be all dark chocolate if you prefer! 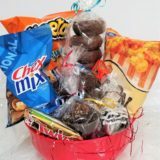 Mix it all together for a custom designed gift basket from Basket Express! Santa’s Bringing Christmas is a great option that can be “healthied” up for you! From One Chocoholic to Another: Merry Christmas! May your holiday be bright and your tummy be healthy! 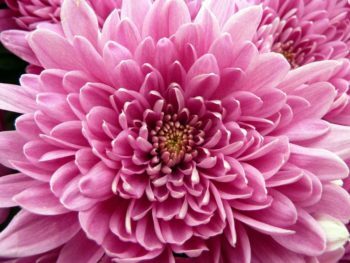 Probably one of our favorite fresh flowers to use in floral arrangements, the chrysanthemum is a beautiful, bright, cheerful flower that seems to say “Hello” to everyone it sees! 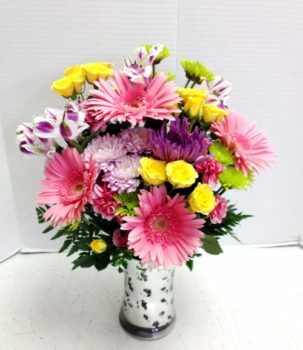 We carry them in assorted varieties, and usually in white, yellow, lavender and green. 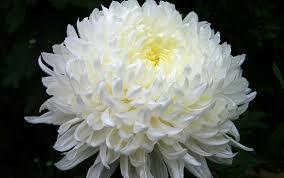 Like the rose, a red chrysanthemum symbolizes true love and the white one stands for innocence and purity. 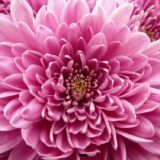 The Chinese and the Japanese see the chrysanthemum as a strong symbol of youth. It is believed that a petal put on the bottom of the glass filled with wine will make you live longer! 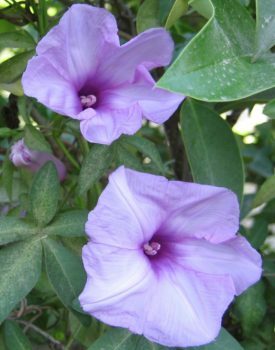 In the Chinese folklore, this flower keeps gray hair at bay. They are perennial flowers that are very beautiful. After they are done blooming, you should place a layer of straw as a mulch in order to keep the cold away from them. 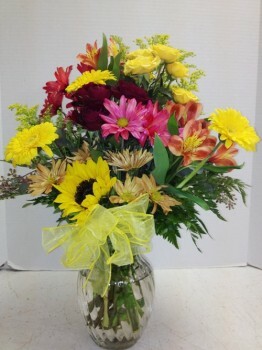 We love designing with these beautiful flowers. 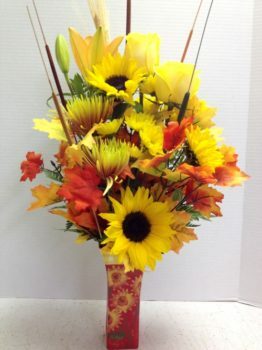 You can visit our “Fall” section on Roadrunner Florist for more pictures, and I’ll post some pictures so you can enjoy them with us! One of our favorites is the Cornucopia, which is the symbol of the bountiful harvest we celebrate in November. I think November people are very special people. My mom is a November 25th baby. My first boyfriend Benjy is a November 23rd baby. What is your birthdate in November and what sets you apart from everyone else? It’s kinda sad when the Big Box Stores are already selling Christmas trees in October. Heck, the World Series hasn’t even started, and football season isn’t even half over! But here it is, Christmas, kicking us in the face even before Halloween! What does that mean to the customers of Basket Express? 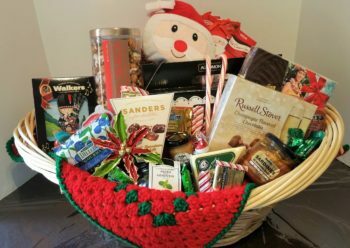 It means we’re getting ready for a great Christmas season, a time to help you choose FRESH, CUSTOM DESIGNED GIFT BASKETS, the kind you won’t find at the Big Box Store! 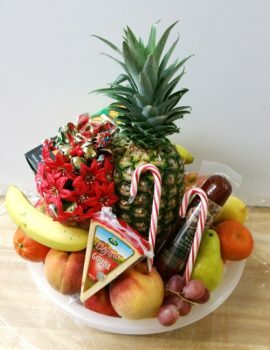 Your gift basket is UNIQUE to you! It’s a one-of-a-kind, perfect for the lucky person in your life! It’s not one of a thousand, sitting on a pallet after a long ride on a slow boat from China! It’s DIFFERENT, because YOU ARE! For us, it’s the year of the Hot Cocoa! 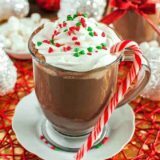 It’s been a long time since we celebrated the joys of cocoa, but our cool, wet weather has inspired me to hope that we’ll have a winter season this year! 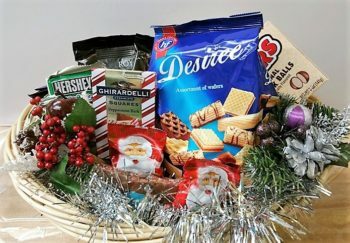 So Basket Express is specializing in cocoa this year, with Biscotti, mugs, chocolates and marshmallows! What a fun way to say Merry Christmas! YUMMM!!! The Year of the Hot Cocoa! 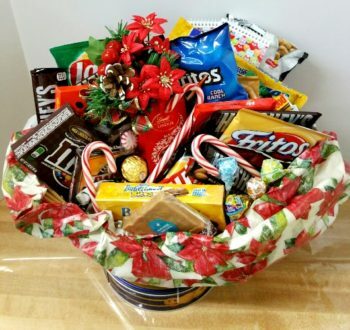 We promise it won’t be kinda sad when a person receives your gift basket from Basket Express! 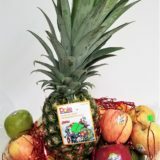 Our gift baskets guarantee a WOW! 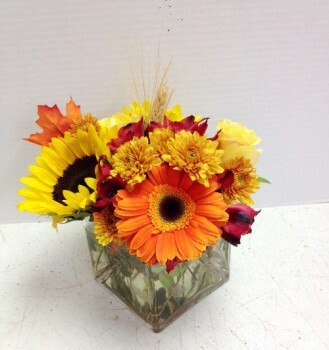 The birth month flowers in October are the marigold and the cosmos. Marigolds are usually offered as signs of eternal love. 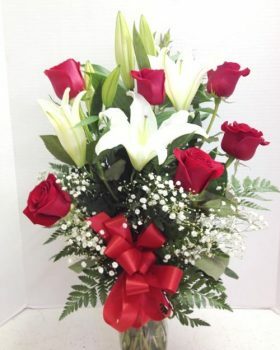 They also mean that you are happy to be with the person who receives the flower. There a lot of species of marigolds, and they range from 6 inches to 5 feet in height. Have you ever walked into a nursery and followed your nose to the marigolds? They’re often bright orange or yellow, and almost pungent! They are the best plant to add to your garden if you want to keep the bugs and critters away! Cosmos stand in for serenity, order and peace. They are semi-tall annual plants that are planted along fences and borders. Usually, they attract bees, birds and butterflies to the garden. 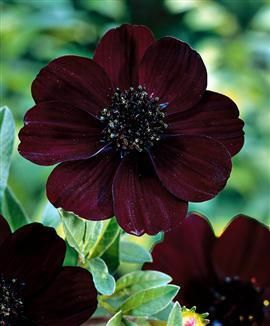 Most people love the chocolate cosmos and prefer it for their garden. 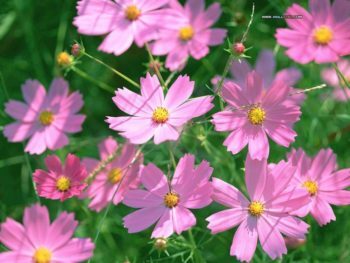 Cosmos flower history states that it is a popular flowering plant grows and blooms twice a year. It is 3-6 ft tall plant and if cosmos flower history is to be believed it attracts visitors from nearby and far off places to see glorious and profuse blooming of poppies in spring season and autumn season. 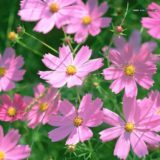 This means that cosmos glower history has witnessed blooming of these flowers every year from April to June and September to mid- October. Because these are plants, we use neither when we design flowers at Roadrunner Florist. You can check out other autumn designs on our website or enjoy these now. Happy October birthday to our friends celebrating now! We hope you have a terrific day, month and year! You’ve been waiting with the rest of us, watching as the teams and players unfold, preparing your Fantasy League and hoping for a winning season! You’d love to see YOUR team play in Mercedes-Benz Stadium in Atlanta on February 3, 2019! We’ve had our preseason and the predictions are in! But we all know the chosen one isn’t always the winning one, and we love to cheer for the underdog! But in football, we cheer for OUR team and no other, no matter what! Which team is my team? 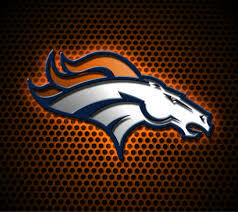 It’s no secret I’m a Denver Bronco fan. Born and raised! I joke that I was born in Denver Mile High Stadium, and the tickets that my dad bought in the 1960s have been passed down to my brother and now to my nephew! As a transplant, I support the Arizona Cardinals, except when they play the Broncos! Can you name all of them? I can!! (Hint: They’re in alphabetical order)! The first person to comment on this post with all 32 names will receive $10 off your next FOOTBALL gift basket order from Basket Express! 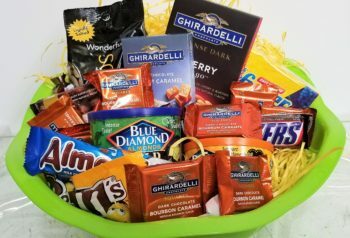 It doesn’t matter which is your favorite, we can design the perfect gift basket just for you! Simply tell us the team (professional or college) and we’ll add the special paraphernalia that’s perfect for you! 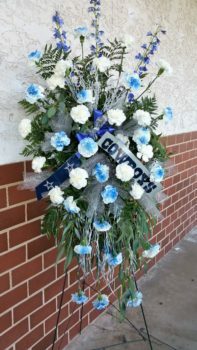 Here’s a beautiful funeral spray that can be designed in the colors of your favorite team. The first game of the season is September 6! 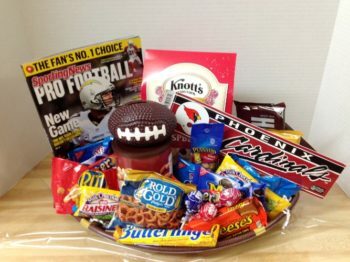 Hurry and contact me for that perfect football gift basket! We look forward to playing football with you this season! 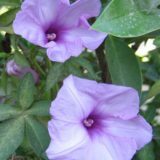 September comes with a breeze of cool air and brings us the birth month flowers morning glory and aster. Morning glories are flowers that symbolize affection. If you are an early riser, you can notice them bloom. It would be best to take advantage of this moment of the day because later they will curl and close. I found it a bit comical that there is a morning glory muffin! They are a glorious way to start any day. They combine the great taste and chewy texture of carrots with the wonderful flavors of apple, raisins, coconut, walnuts, and cinnamon. Sounds yummy, doesn’t it? Asters have always been appreciated for their symbolism of a powerful love. Maybe because of their meaning, people used to burn the aster flower to keep serpents at bay. They bring some color to the early fall views and they don’t need that much maintenance. Asters are the grande finale to the perennial garden, displaying vibrant fall colors in shades of pink, purple, blue, and white. They’re also one of the last great feeding opportunities for bees, butterflies, and other pollinators. For gardeners, it’s a two-for-one deal: beautiful blooms and a flurry of attractive wildlife. Although there are many varieties and classifications of asters—New England, New York, heath, calico, aromatic, smooth, and wood, all native to North America—the basic qualities to look for when choosing one are height, bloom color, and bloom time. 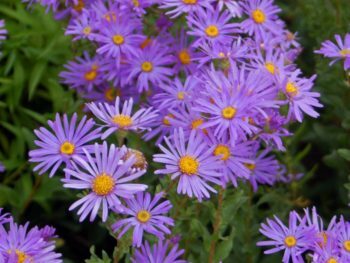 Whether you’re choosing one variety or several varieties of aster to brighten your fall garden, consider all of these factors. Once you’ve narrowed your options and made your final selection, some basic know-how will help you get the most out of your asters and keep them looking their best. We design many floral arrangements with larkspur in lavender or white. It’s a pretty, soft flower that seems to soften a floral piece in just the right places! Rhymes with Orange is one of our best sellers! If you are fortunate to be, or to know, a September baby, then you share in the Fall Equinox. This beginning of the autumn season might change your mood, but it will never lessen the importance of having a September birthday! I’m asking you, What’s for Birthday? No, that’s not the same as “what’s for dinner”, but I guess it’s related somehow! Birthdays are one of our favorite occasions. 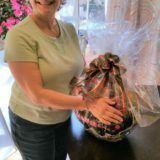 We love when people call and tell us it’s mom’s birthday, or my son’s 21st birthday, or my granddaughter’s 5th birthday! Whatever the number, we have the perfect Birthday present just for you! Our websites are loaded with ideas, so I thought I’d put some of our favorites here for you to see. After all, if we love it, then you probably will to0, right? So here goes! We call this Happy Birthday Short N Sassy. 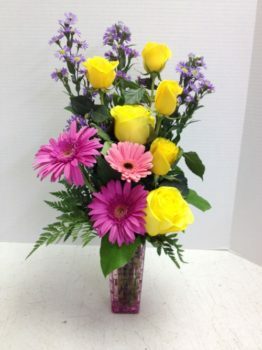 Maybe that’s because it’s a cute floral arrangement that’s great for a cute, young (or young at heart) sassy lady! 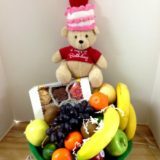 This is our Healthy Happy Birthday Gift Basket. What makes it healthy? The fresh fruit (and cookies!). Well, that’s pushing it a bit, but the fruit is healthy (even if the cookies aren’t!) We love the teddy bear that sits atop this great basket! He’s wishing a Happy Birthday from ear to ear and year to year! 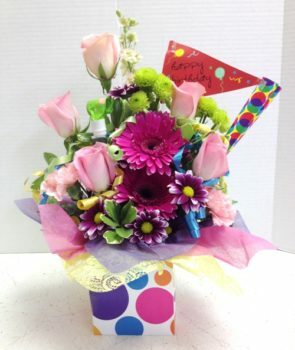 The Happy Birthday Box is a fun-filled floral arrangement that’s decorated with ribbons and horns! 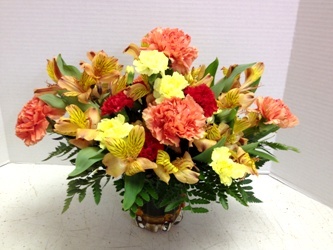 This great arrangement can be designed in masculine colors and it’s perfect for a co-worker or friend! 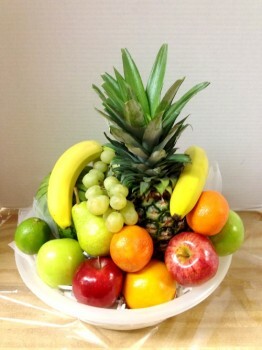 Named our Happy Birthday Celebration, this fresh fruit basket is a healthy celebration. 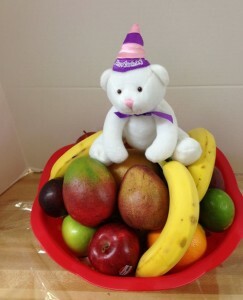 We’ll top a terrific fresh fruit basket with a white teddy bear that’s just waiting to be placed on top of your table or desk! He’s a cute reminder that today is your special day! 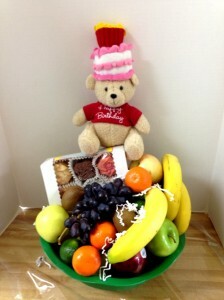 A fun filled pamper basket is topped with a great Happy Birthday teddy bear! The fun of this is we also have the bear in Spanish (Feliz Cumpleanos) so we can make this personal for you! Birthday in a Bag is one of our top sellers. 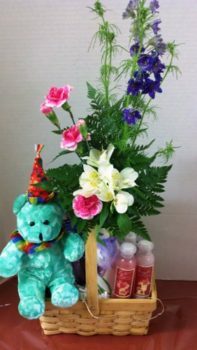 We really have fun with this, because we use the freshest flowers and colors to create a fun, festive birthday arrangement that’s PERFECT for a guy or a gal! One more picture, because I simply couldn’t resist! 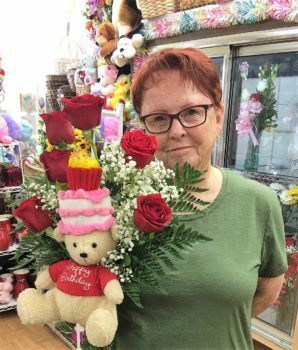 A special person ordered 6 red roses and a bear. 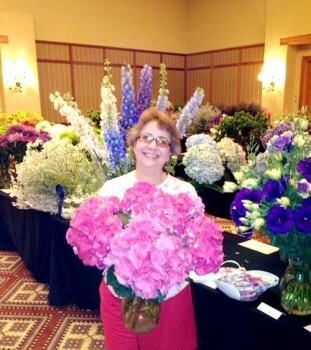 This is our driver, Gayle, carring the flowers she was leaving the store! So pretty with her red hair! 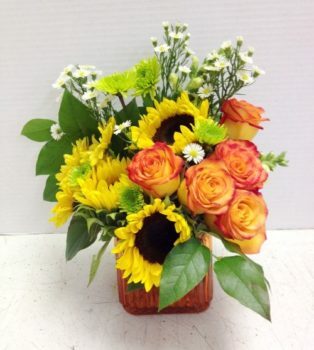 If you’re interested in this arrangement, simply call me at 602-246-1271 and we’ll fix you right up! Birthdays are every day of the year! 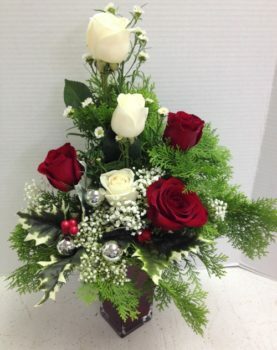 Remember your LOCAL FLOWER SHOP when you’re choosing this important gift! We love teachers, and we know you do, too!! Teachers are the backbone of our community, from Kindergarten to College, and everything in between! We love these devoted men and women who try so hard to educate our children and prepare them for the life ahead. Our schools start this week (or some started already) and schools across the country start in the next month or so. 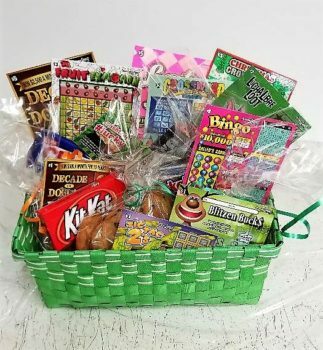 A gift basket from Basket Express is the perfect way to say “THANKS” in advance or “HAVE A GREAT YEAR” to the teacher in your life! What, you say, should be inside that basket? Well, Apples, of course! 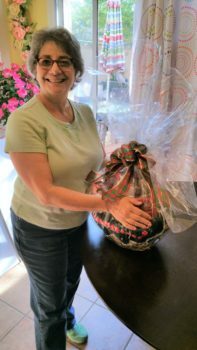 That means a perfect gift for a teacher is a gift basket loaded with apples, oranges, pears and other fresh fruit of the season. 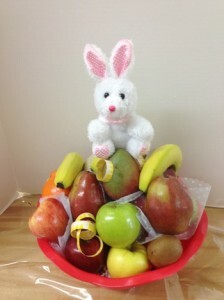 A really nice fresh fruit basket, we call this Dress Up! It’s fancy, but not too fancy! It’s perfect for sharing at school (if one is so inclined) or taking it home to enjoy with the family! 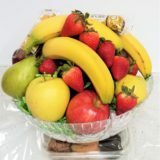 If you want to add cookies to your fresh fruit, then consider our Pedestal Fruit and Cookies gift basket. It’s loaded with fresh, seasonal fruit, all topping a box of fresh baked cookies! 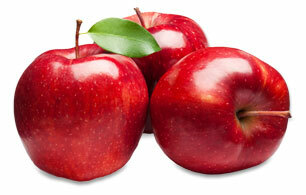 Many people are eating totally organic food these days, which includes fresh fruit that is hand-selected each morning. If your teacher is a coffee and nut connoisseur, then consider our Coffee and Nuts gift basket! Filled with a delightful mixture of nuts, crackers, cheese and sausage, we’ll add assorted coffee to make sure she’s staying awake all day! Each of our baskets can be custom designed in the school colors or, if it’s higher education, with the school logo. Our local schools, ASU, UofA, GCU and many others, enjoy their special identification that we’re happy to include for you! Custom designed gift baskets from Basket Express are the perfect way to welcome a teacher to the new school year! Order yours today!